Tatum Ranch is a master-planned community of 3,400 homes and five commercial sites in the northeast corner of Phoenix, where North Tatum Boulevard and Cave Creek Road meet. Tatum Ranch homes are within the Upland Sonoran Desert life zone, with seven washes or arroyos, trending northeast to southwest. It is home to some of the most beautiful native Sonoran Desert vegetation and wildlife in the entire Southwest. Residents enjoy the quiet beauty and serenity of the Desert. 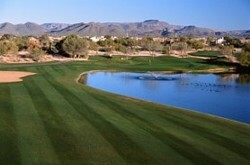 Tatum Ranch Club & Golf Membership is separate from property ownership.